Mommy (me!) 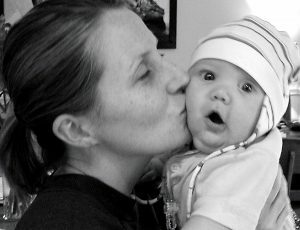 kissing my sweet boy, Hayes. I have always felt that his little eyes were filled with joy as my lips touched his cheek. I was recently asked to be an official ambassador for Dr. Josh Axe, a mentor of mine. I received the worst phone call imaginable. “Hayes isn’t breathing,” said the voice on the other end. I rushed to the hospital. I was finally taken to his side. They were working to revive him but expressed that, at this point, he would have severe brain damage. I asked him to come back to mommy. He was gone. It was through the loss of my 4 ½ month old baby boy, Hayes, that led me to the realization that I must take care of myself to be happy. I will never get over the loss of my son, (you learn to live with that pain), but I knew that I must feel good inside to be able to handle what’s on the outside. After some time, I could see that I wanted happiness for others. In addition to my marketing and branding boutique, Oliver Creative, I was able to start a foundation in honor of my son, The Hayes Foundation, (now a part of a national organization, The CJ Foundation For SIDS), and began speaking publicly about SIDS awareness. I created the This Side Up Campaign helping babies across our country and beyond with a onesie stating “This Side Up While Sleeping” in 3 languages. But as therapeutic as the foundation was, it wasn’t enough. My body and mind needed health in the best way possible. I was given another gift. I became a marathon runner (running 2 “Bostons”, 2 New York marathons, the Paris marathon and more) and now am an Ironman Triathlete (placing in the 25th percentile in my age group and as an All World Athlete) about to do my 3rd full Ironman in Boulder, Colorado (2.4 mile swim, 112 mile bike, 26.2 mile run). This led to me teaching fitness classes and coaching marathoners, triathletes and overall health and wellness, but it wasn’t until I took Dr. Axe’s course that I was able to take it to the “public figure” level. 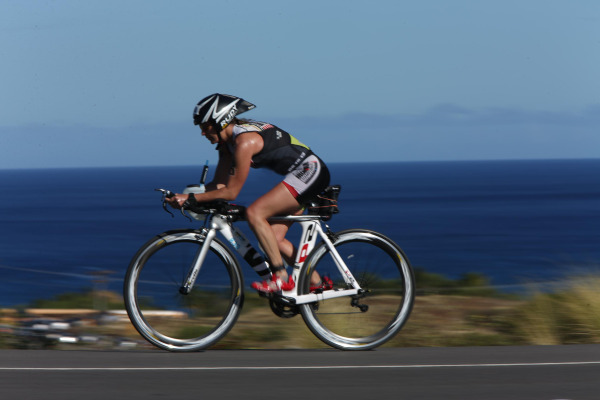 Half Ironman in Hawaii, 2014. I met Dr. Axe many years ago. I had won a ticket, through his radio show, to have dinner with a group while Dr. Axe spoke about wellness. I flew from Richmond, Virginia to Nashville just to meet him. Dr. Axe quickly became a mentor of mine. I loved his teachings, his philosophies, his positive and uplifting spirit, his thinking on health and wellness, his business ethics and his love for God. In the midst of working on my wellness business and trying to figure out how to launch it, I launched a food product, yu•mi. The joy of giving others delicious food that feels good, both while you eat it and afterwards, made my heart sing. Even kids loved it. I felt as though I was bursting at the seams with desire and intense passion to be able to serve others with my health and wellness knowledge. I even began studying essential oils because I choose to avoid chemicals on all levels possible, and that gave me a holistic approach to my beliefs in wellness. I hemmed and hawed, (defined as wasting time overthinking), a good bit. Do I need more content before launching anything…do I need more credentials? And FINALLY, I COULD BREATHE! I realized that I lived and breathed wellness deep in my heart and soul. I was there! It was then that my understanding of my purpose here on this earth truly came to life; I was fulfilled with a life of love, compassion, health, wellness and most importantly all through GOD. This empowered me to learn how to share this knowledge and understanding of how to serve others; trusting that I had something special that could help others gain this beautiful well being that we are meant to have; a gift we were all given! I am so grateful for each and every one of you and to Dr. Axe for giving me the guts I needed to be the person I am! While I am still building, preparing, studying, nurturing…I have a place that is truly my home and I will always strive to do better and be a better child of God. Thank you for listening and for being here. Much love to you all and blessings always! It’s always stories like yours that turns out to make people like you, courageous bold smart intuitive and very brave. Very nice and inspiring story thank you so much for wanting to share, it’s much appreciated and enjoyed. May your success continue and your love for what you do continue to grow . Thank you so much, Scott. I am sorry that I am just now seeing this message. Not sure if you saw my post on FB today. Check it out if you have time.